Several years ago I meandered into an antique shop near the Jockey Lot flea market in Anderson, South Carolina and happened on a great sale. The store, which had a GIANT rocking chair in the front yard, had stacks of vintage pop crates - all on sale for a mere $7 each! 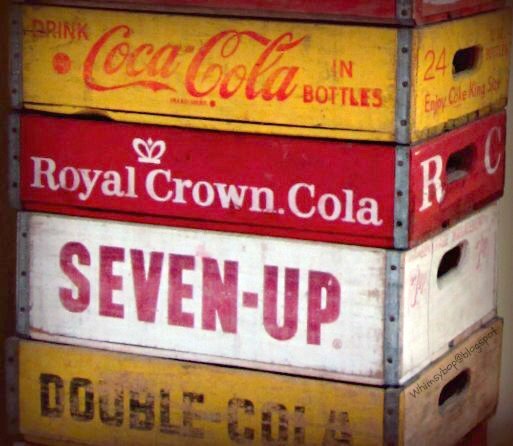 Just a month prior I had bought my first Coke crate for $22 at an antique mall, so you can imagine my excitement. I had no idea what I was going to use them for but at that price I knew that it would be wise to buy a few and figure it out later. At the time we were living in California, so after I picked through the stacks and made my choices, I had to store them in my parent's barn for a few years until we moved closer (oh the torture!). Each time we move into a new home I enjoy doing something different with my pop crates - well not too different as there is only so much that can be done with a stack of crates! The challenge is getting around those little grid sections which some have on the inside that once kept a bottle of pop securely in place to prevent it from breaking en route from factory to store. Unless you remove the inner sections, (which I wouldn't recommend because you'll decrease the value), you're sort of stuck with working around them. 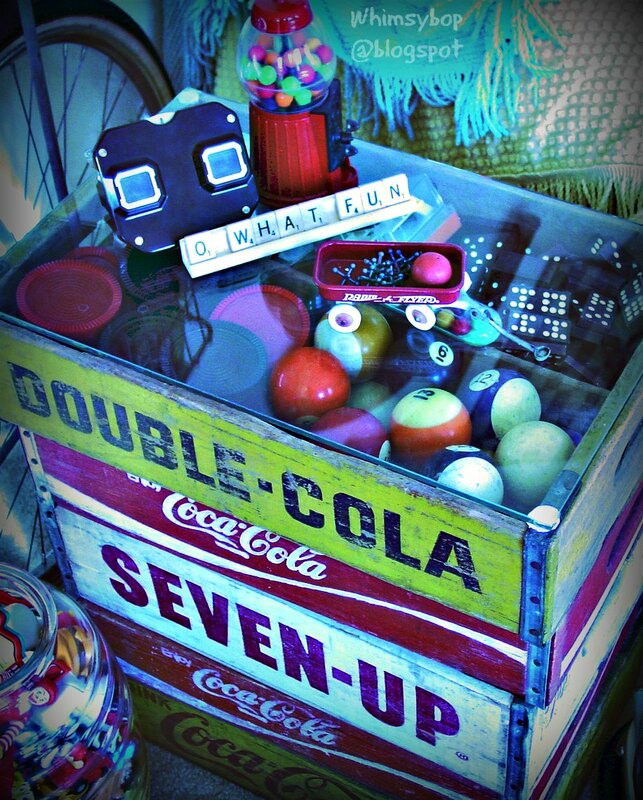 I've seen some clever things done with old pop crates, mostly as shadow boxes or used to organize and store items. In our last two homes I've used them as end tables near the sofa in the kids tv room, making two short stacks and filling the grids on the top crates with various eye candy to admire beneath a piece of glass. In our current home I keep my crates stacked high in the game room to add a tower of color. The top crate in my tower doesn't contain grids so it's a great way to display other fun collections too, (like my ever growing etch-a-sketch collection!). In the same room I keep a crate beneath the entertainment center which hides my son's collection of video games perfectly, (I tacked a piece of felt beneath it to allow it to slide freely like a drawer without scratching the floor). A few months ago my daughter and I hit The Old Factory Antique Mall in Verona, Virginia (which I highly recommend for a FULL day of fun!) 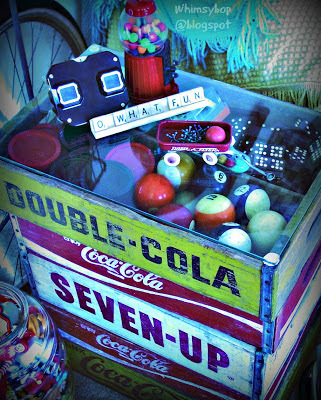 and found a booth selling stacks of vintage pop crates for $12 each - still a good deal! From my shopping experience, the average cost of a pop crate is about $15 - $20; although some are higher depending on where you live and also on the condition, color and the bottling company. Often times you can find the date etched or stamped somewhere on the handle side inside of the crate. I'm from the Buckeye State of Ohio and grew up calling fizzy carbonated beverages "Pop." My husband grew up in the Tarheel State of North Carolina where every soda was referred to as a "Coke," regardless of the brand or flavor. Since living on the west coast for many years, we have both assimulated and now call our fizzy drinks "Soda." Just the other day my 15 year old son announced that he would start saying "Pop" from now on because it sounds fun to say! He's right, "Pop" is fun to say - so much that I think I'll go back to my roots and join him! Just curious - where are you from and what do YOU call your fizzy drinks? I love your end table idea. Living in your house must be SOME fun. You've got so many things to look at and they stir up memories. You're good at bringing out the fun in everyone. I miss ya Friend Frog. Yep, always lots of BIG fun going on around here! Miss you too! Hi Terri! I love seeing all your collections. I didn't realize you had a blog until I saw your bicycle with flowers in the basket on facebook. I have been blogging since 2008 and love it! You are doing great!